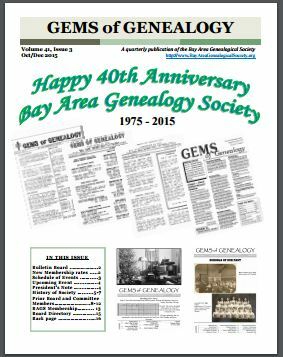 The Bay Area Genealogical Society (B.A.G.S.) newsletter, GEMS of Genealogy, is published four times per year. Members of B.A.G.S. receive the newsletter via mail. The newsletter has news of upcoming workshops, queries, and information of interest to those doing research in Brown County, Wisconsin. B.A.G.S. actively exchanges newsletters with similar groups all over the United States. All queries are published for free; however, members are given priority. Or you can email it to our Newsletter Editor.